Green in brand and green fingered in nature! We’re a green fingered bunch here at Pharmacist Support. So, given that it’s National Gardening Week we thought we’d share with you some of our gardening stories. Gardening is a great way to get active. Being active is 1 of the 5 ways to improving wellbeing – something we’ve learnt here at the charity through our Wellbeing Workshops and that we’re encouraging everyone to get involved in. Here our new Fundraiser Petra, tells us about what she’s been up to down on the allotment. This week is National Gardening Week and I made a good start by going to my allotment yesterday. Although my gardening partner called off, I was not deterred as I felt the need to go outside and do some digging. The fresh air and the exercise always make me feel better. It is also a good way to clear the head and to focus my efforts elsewhere rather than being at home worrying about all the things that need doing there. The plot did not look as bad as I had feared; some fences were blown over and beyond repair but that will encourage me to learn a new skill as I’ve never built one before. Other than that, the dandelions on my patch have stayed away mostly and the soil is pretty loose. I dug in the remainder of the mustard leaves as green manure and got the garlic bulbs and the carrot seeds out. This year I am planning to sow quite a few flowers as well as vegetables since the plot is too big to feed a family and it is a nice way of inviting the bees in. It was lovely to see so many ladybirds amongst the mustard flowers; counting them is a good way to keep the children entertained! 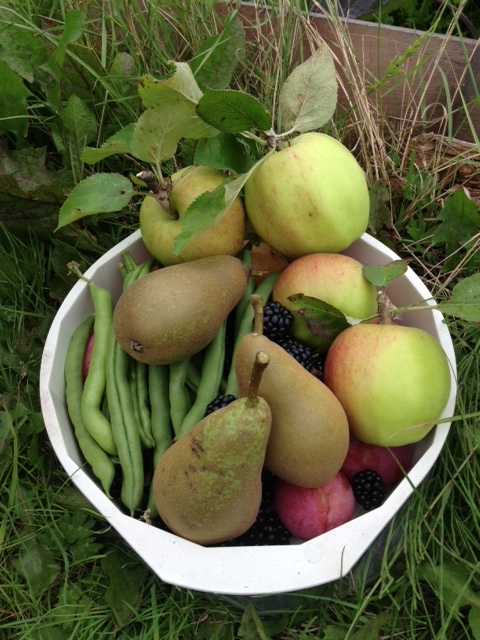 Last year I got some lovely produce and I am looking forward to this year’s home-grown fruit and vegetables. In the next week I will be planning the rest of the plot. I hope the sunshine continues and if you do go out gardening that the fresh air will give you lots of energy and motivation to carry you through your working days. If you happen to buy plants and garden accessories online we’d recommend using the Give as you live website. It is free to sign up and shops will automatically donate a percentage of the sales to the charity. There’s an endless list of garden tools available through registered shops such as Amazon, John Lewis, Marks and Spencers, Ebay and many more. For our next gardening post go Knee deep in manure!